We stopped for a dairy-free, nut-free snack of French fries at Electric Umbrella. 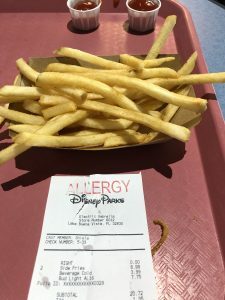 The cashier told us the fries were cooked in a dedicated fryer but forgot to note the food allergy. When I noticed the omission on the receipt, I asked her about it so there was no possibility of cross-contamination in the kitchen. She called a manager and the manager personally prepared the fries. Yesterday (12/22) my husband and I decided to go to Electric Umbrella at Epcot to grab a quick lunch. 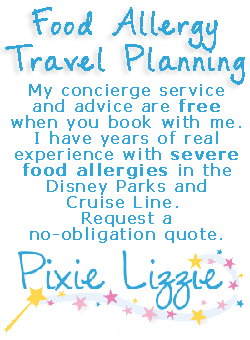 I have always had excellent customer service and excellent accommodations made for my food allergies at Disney at sit-down restaurants in the past. I usually pack a light lunch to eat on the go though so that I do not have to worry about getting food at any of the fast food restaurants for lunch. Even though I had packed a lunch and already had dinner reservations for that evening at a sit-down restaurant, I decided to see if they could accommodate my allergies at this restaurant because if they could it would mean I could eat a hot meal (which would be nice since it was cold outside). When we got to the cashier to place the food order, my husband asked if we could see a food allergy menu. The cashier immediately called over a manager who discussed the special food allergies menu with us and showed us the ingredient list for items on the menu. They offered Annie’s Gluten Free Macaroni and Cheese on the menu, but unfortunately it was the version that had dairy and soy in it so I could not eat it. They also offer Allergen Free chicken tenderloins which are Gluten Free, Dairy Free, and Soy Free which I would have been able to eat except they are made with garlic which I can not have. When I said I could not eat either of those, the manager and cashier were both very apologetic and asked if there was something else they could get me such as maybe a fruit cup at least. I explained that I had packed a lunch just in case I could not eat the food at the restaurant and that I would just eat that. My husband went ahead and ordered his food though (my husband is blessed to not have any food allergies or intolerances). This experience told me that this restaurant is being accommodating though and has options that are great for people who are gluten free and dairy free. 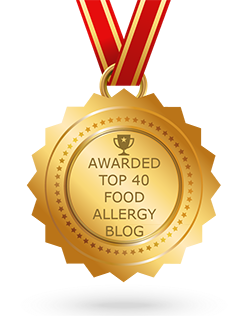 I hope that as time goes on that they will add more items to their special allergen free menu to accommodate people with even more food allergies and intolerances.